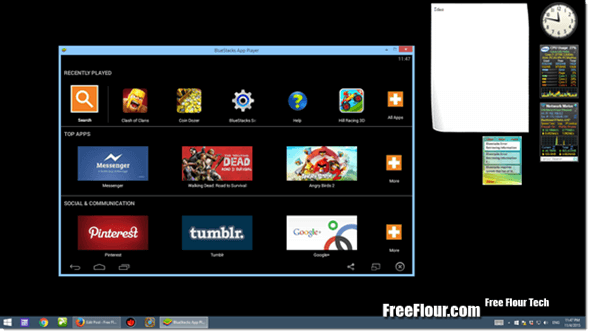 How to download and install Bluestacks App Player and run any Apps you like on Windows 7/8.1/8/10 or Mac for free. Fix for Bluestacks errors. Ever thought of running your favorite mobile apps or games on your desktop or laptop computer? Tired of having to keep charging your smartphone or tablet in order to play your games for a long period of time? Well, Bluestacks 2 App Player makes running mobile apps such as WhatsApp and Clash of Clans on PC possible. We introduce this software on our blog because it is too good to be missed for our precious readers, and it is completely Free to use! However, you will be asked to install sponsored apps gradually in your Bluestacks in order to continue using it for free. These sponsored apps do no harm at all and you can opt to uninstall them anytime you want. Well, if you are so generous enough to donate Bluestacks, there is an option to pay 2$ per month to Bluestacks and you will not be asked to install any sponsored app again. Bluestacks App Player can easily be downloaded from its official site bluestacks.com. By default, your OS will be detected and Bluestacks will show you the appropriate download link for their installer. Just click on the “Download for PC” button on its homepage to begin the downloads. As for installation, it should be pretty plain and simple like any other program installation. If you meet any error such as the most common ones that may appear during the installation, the Bluestacks error 25000, error 2318, error 1714 or error 194, scroll down this page and look for our suggested solutions written below. We do not represent Bluestacks nor this website is in any way associated with Bluestacks. We introduce Bluestacks solely because it is an awesome app we think we should share the word out to our readers. If you have a problem with Bluestacks, visit bluestacks.com. Bluestacks originally wasn’t made for Mac, not until recently, its company has finally released a version for Mac users. The “Mac version will be coming soon” message was there on their site for nearly a year before they actually released it during summer in 2015. Good thing for Mac lovers and now you can run Bluestacks on your Pro or Air. It is free to use too for mac users, and like how it is for PC version, you will be asked to either install their sponsored apps from time to time to continue using it for free or pay 2$ monthly without sponsored apps installation. To download Bluestacks App Player for Mac, go to bluestacks.com and click on the “Download for Mac” button on its homepage. Download will then begin shortly. As mentioned above, installation should be easy. If Bluestacks shows error 25000, error 2318, error 1714 or error 194, read below for our suggested solutions. If you see something like the error above, you should probably be looking into your graphic drivers and update it if you haven’t already done so. If you were trying to install Bluestacks on VMware, VirtualBox or any other virtual machine and receive this error 25000 while installing Bluestacks, it means that your virtual graphic card is not supported. Sometimes it only happens to certain OS version. From our experiences, Bluestacks installed successfully on virtual Windows 7, Windows 8 and Windows 8.1, but we never make it to work on Windows XP. If you receive any error while installing, it may also indicate that you have insufficient memory RAM that required by Bluestacks. Consider adding more RAM until you have 2GB or more RAM before you proceed with the installation again. Well, there is a workaround to force install Bluestacks without having to have 2GB RAM. 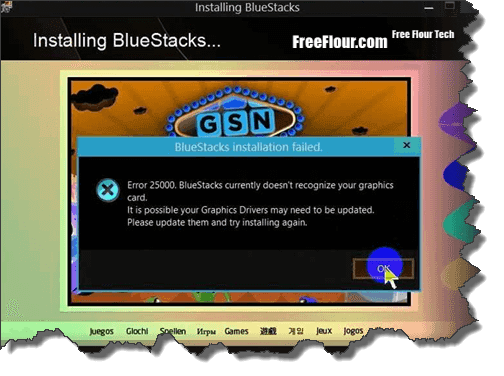 We don’t recommend doing this because based on our experience from running Bluestacks on a 1GB RAM netbook, it crashed frequently especially when running high loaded apps making it meaningless to force install it. If you receive anything like this “The app could not be downloaded due to an error. Error Retrieving Information From Server. [RPC:S-5:AEC-0]”, in order to solve this we need to clear the data and cache of Google Play Store in Bluestacks. To do so, go to Settings, applications, then Google play store. Hit the Force Stop first and then Clear Data and Cache. Restart Bluestacks and see if the error goes away. If you see any error about Bluestacks play store not working, Bluestacks play store authentication is required, or Bluestacks play store server error, the above workaround should also fix the problem. Otherwise, try to remove your Google account from your Bluestacks and re-add it.